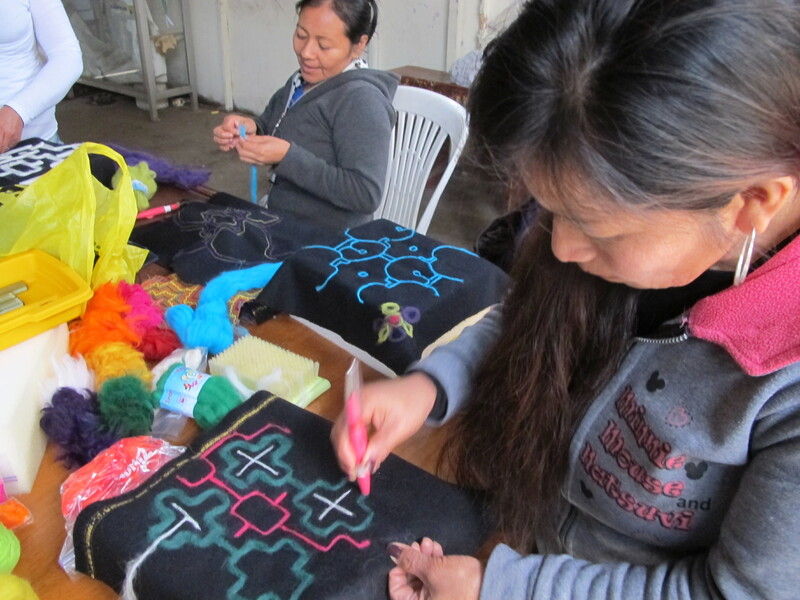 With Las Madres de Ashé de Cantagallo we are applying to the Santa Fe International Folk Art Market. The most important lesson I have learned during my grant period is that it is my research moves along much better if there is a way for me to align my own interests in culture and art with the greater interests of the group. No one is interesting in sitting around an answering a researcher’s questions. That was the first lesson I learned. I am not interested in simply buying crafts and then disappearing, as most visitors have done before me. How do we reconcile these conflicting desires? 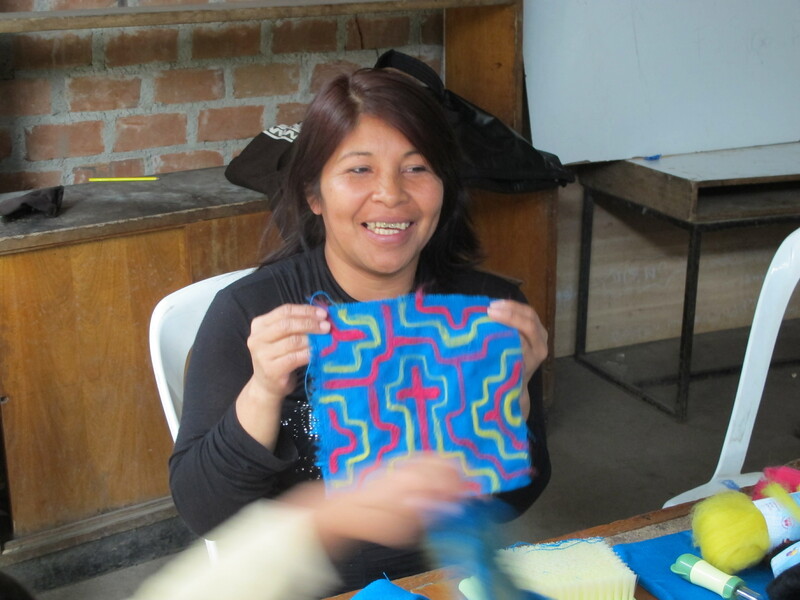 I want to learn about craft and culture, and las Madres want access to a broader market for their art and to learn new textile techniques. 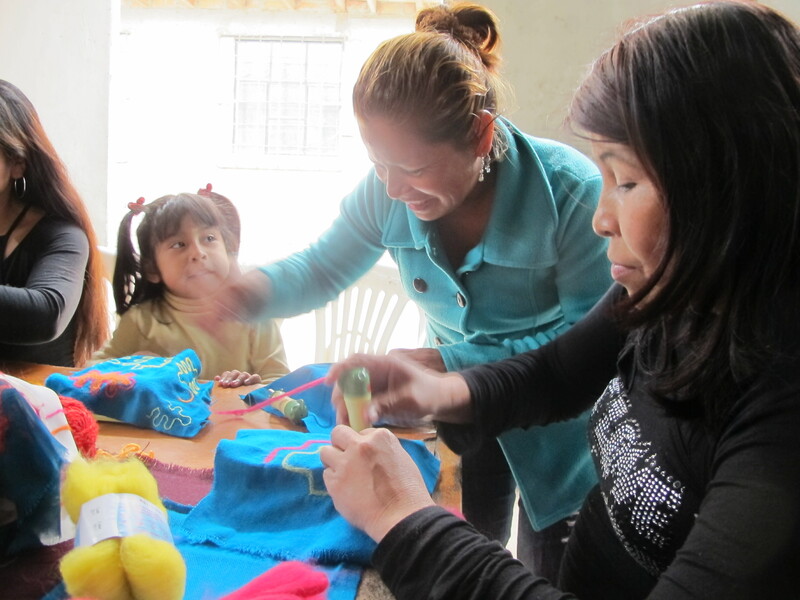 The first was the needle felting workshops, where I provided tools and enough materials to teach and begin experimenting and developing new products on which las Madres could express their traditional patterns. Essentially my position changed from “researcher” to simply “fellow artisan”, and this was a lot more comfortable for everyone, myself included. 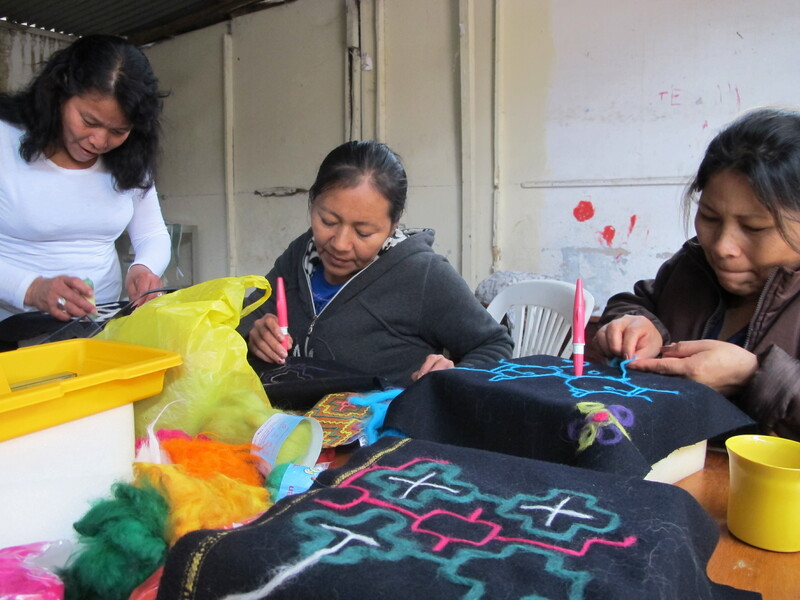 The workshops are a continuing event, and each time we set up the materials and work on projects together, joined by whichever madres are free at the time. 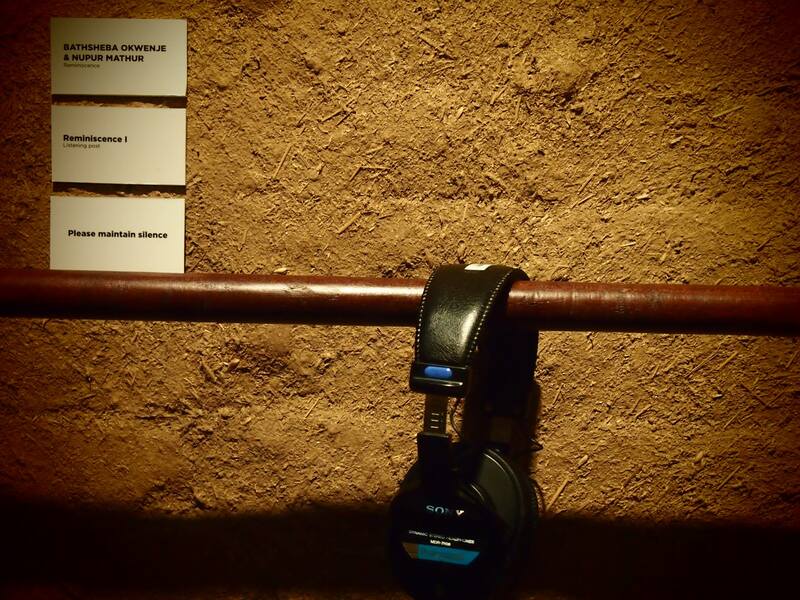 The second is the application to the market which takes place every July in New Mexico. I don’t know what our chances are of getting accepted, or getting financial assistance, which would be crucial since we aren’t supported by an organization… But if I learned anything at art school, it was how to apply for scholarships! 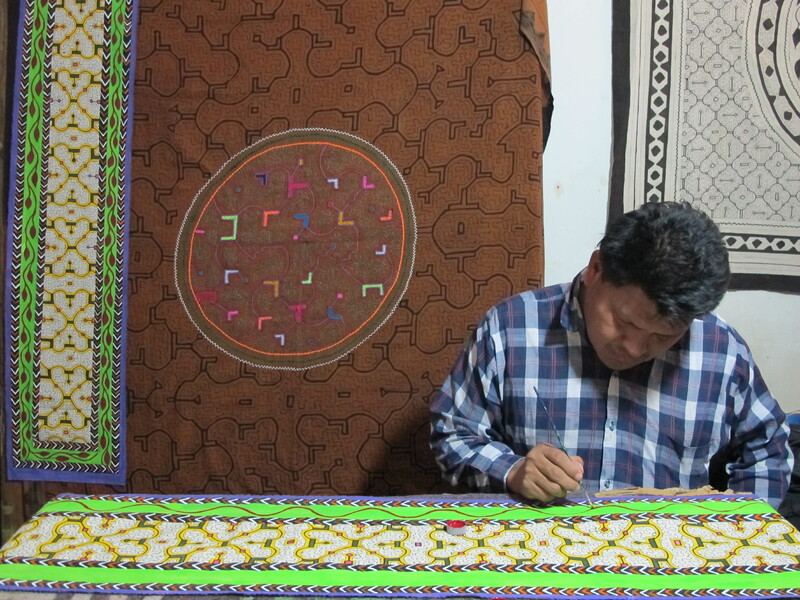 The application in an interesting activity for us to do together because not only is it a chance to gain a new venue for Shipibo art, but we must answer extensive questions about the culture and history; the same kinds of questions that I would want to ask for my research. So, we have started taking pictures of different forms of traditional art each time I go to Cantagallo, and having discussions with different artisans about their work. 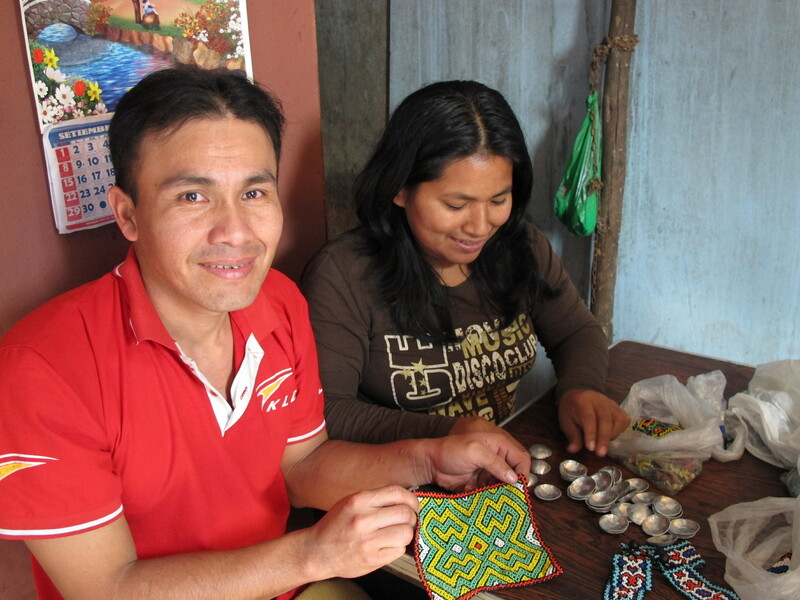 Yesterday I met with Diana Ancón Rodriguez, a member of Las Madres de Ashé, and her husband Fernando, who live in the upper level of Cantagallo and specialize in making beaded bracelets and pecheras, a necklace/chest ornament that are a traditional part of Shipibo adornment. 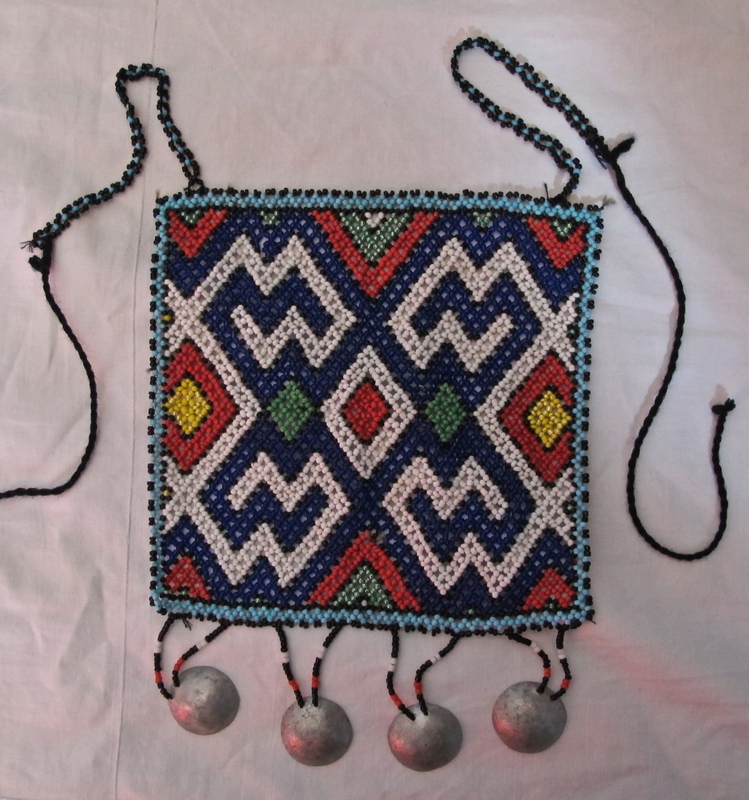 In Shipibo culture, beauty is synonymous with adornment, and therefore coronas (headresses), pecheras, bracelets, earrings, pampanillas (skirts), cushmas (tunics), and historically body paintings with huito oil, are all an important part of being a beautiful Shipibo man or woman. 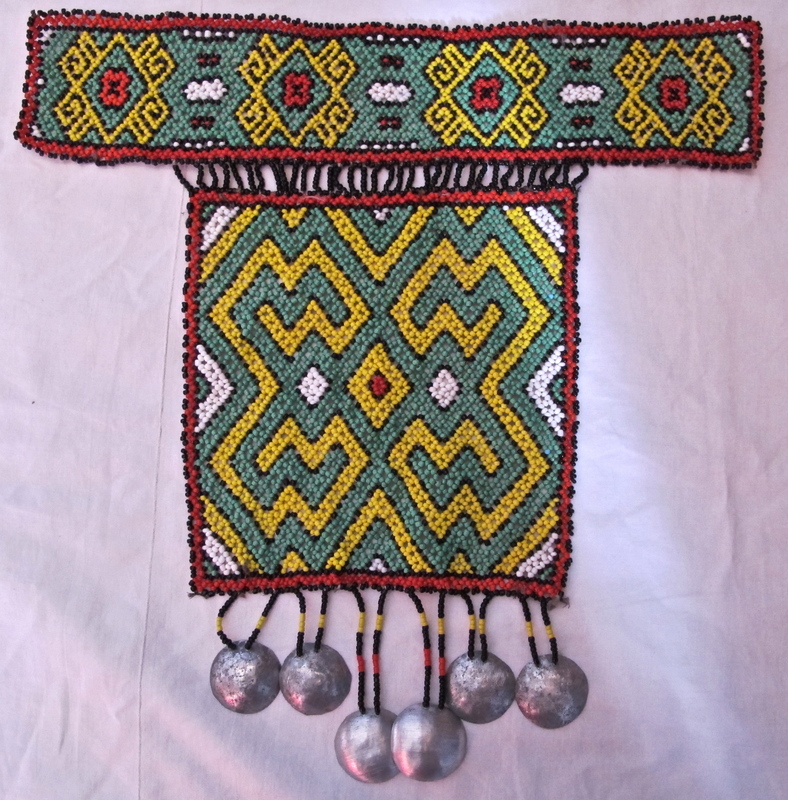 Shipibo ainbobo iresbiresi metsáyamai. Iti jake boo nenké, rapanistani; ikaxhbi jan metsati joaikaya riki non raoti. Jain non saweai sha atibo, jonxhe. Jaskarakaya riki metsá ainbo. Wetsabiresma iki metsá en oina. Jawe kopíma noa raotaoma yakataxh noa metsáma iki, tson noa metsá ayamai. Ja kopíra noa iti jake westíora metsá ainbo inoxh raotia. Jati jake min tononon ati, min keshá ati, paronoti, koribo, mia maxhen bekenetai, mia nanen bexhtetai, mia nanen taxhtetai, mia wikenetai; ja riki metsá ainbo. Noa jawebi raoyamai, noa iamai jawenki noa metsáti iki. La mujer shipiba no es bella así nomás. Tiene que tener el cabello largo, ser algo delgada; entonces con lo que viene a ser hermosa es con nuestros adornos. Nos ponemos campanillas de semillas en la pampanilla para que suenen con los movimientos, pulseras y tobilleras. Así es una mujer bonita. Yo creo que cualquiera no es bonita. Si no estamos sentadas con nuestros adornos no somos bonitas, nadie nos dice que somos hermosas. Por eso, para ser una mujer bella, debemos ponernos los adornos. Debes tener tus sonajas de la cintura, tu adorno de la pampanilla, corona, aretes, adornos labiales, te diseñas la cara con achiote, te pintas la frente con huito, te pintas los pies con huito, te diseñas la pierna; ésa es una mujer bella. Si no nos adornamos no hay nada que nos haga lucir bellas. 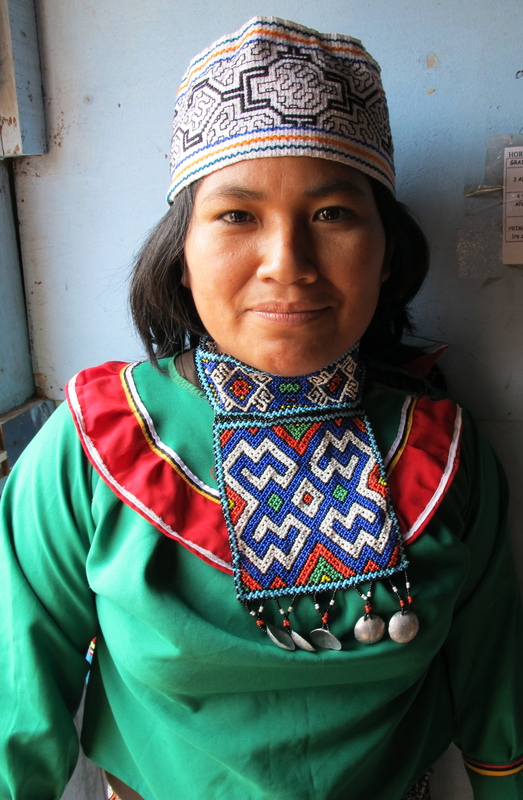 The Shipibo woman is not beautiful just like that. She must have long hair, she must be slim, and then she will be beautiful with all of her adorments. 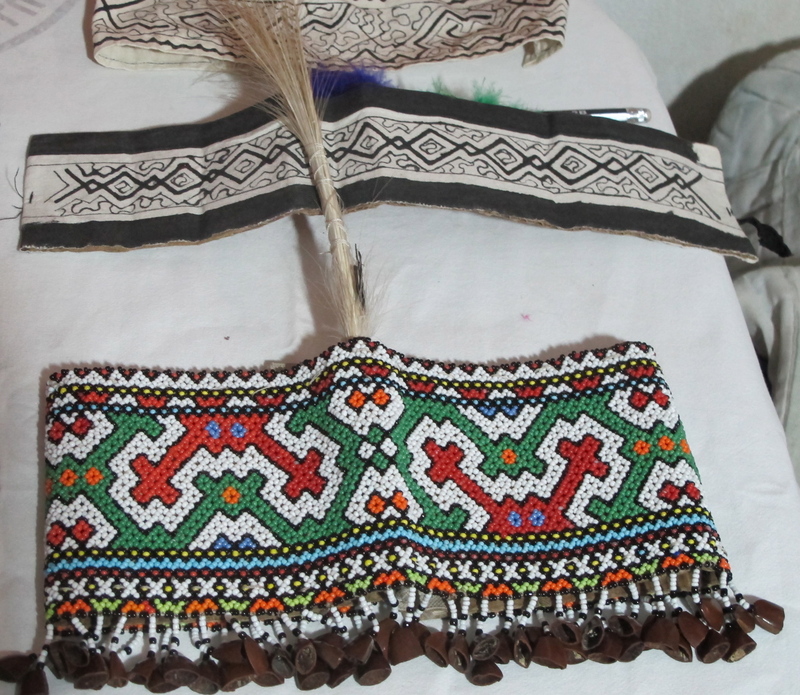 We put seeds around the edges of our skirts so that it makes noise with all of our movements, we wear anklets and bracelets. That is how a beautiful woman is. I don’t believe that just any woman can be beautiful. If we are just sitting without all our adornments then we are not beautiful, and no one tells us we are good looking. For that reason, to be a beautiful women, we must put on our adornments. 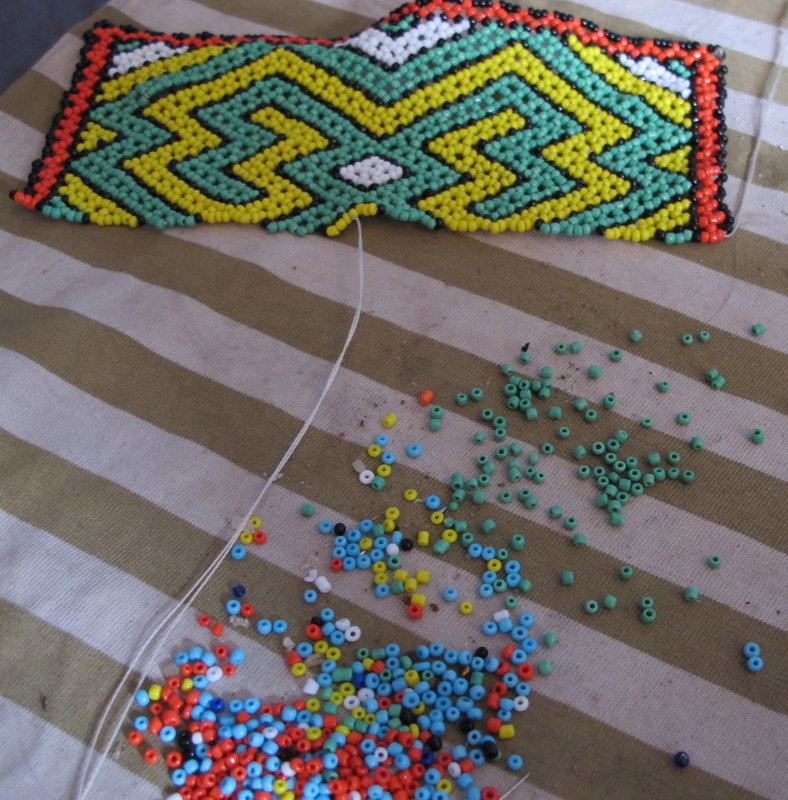 We must wear our beaded belts, our decorated skirts, our headdresses, earrings, lip ornaments, and paint decorations on our faces, foreheads, feet and legs with huito. This is how a woman is beautiful. If we are not adorned, there is nothing to make us look beautiful. 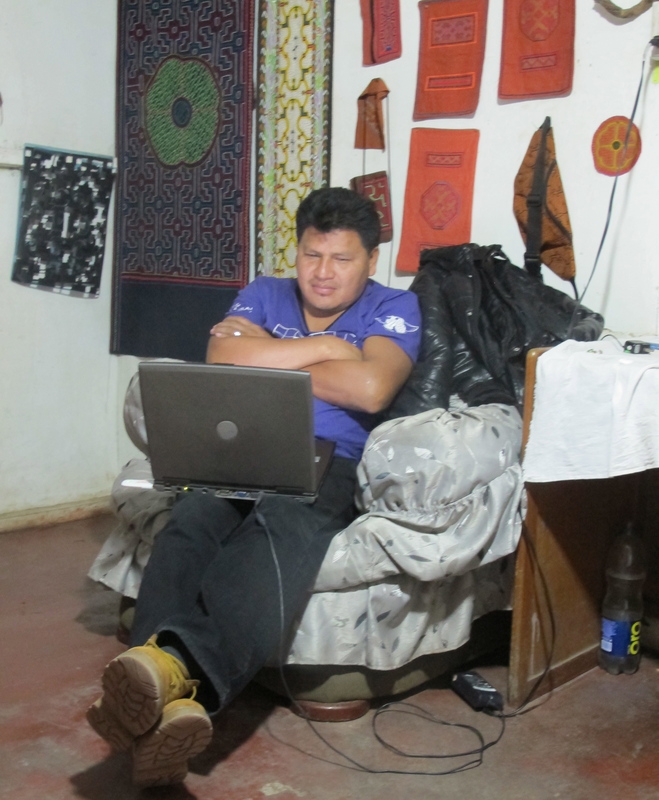 Life in the city of Lima is very different from the Shipibo homeland on the Ucayali river however. 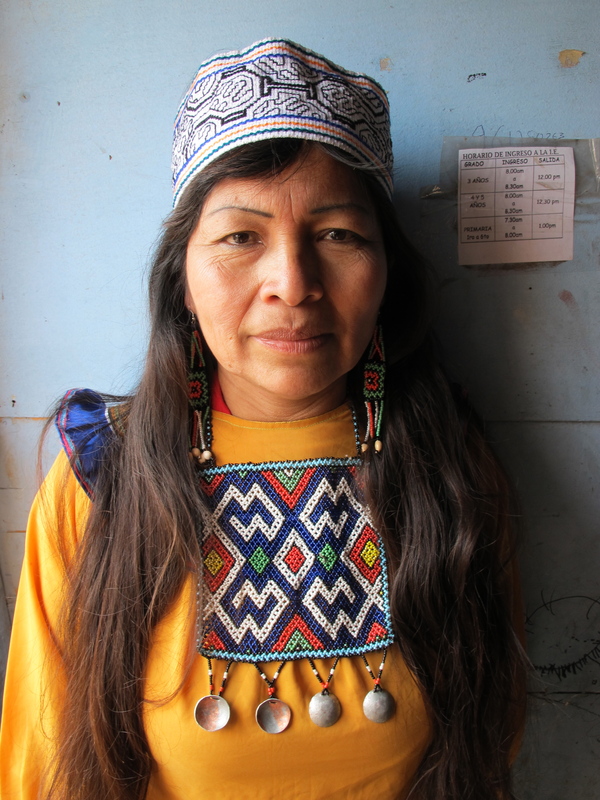 Although the artisans of Cantagallo still have their traditional clothing and adornments, it is difficult to go out in the bustling streets of the city dressed as a beautiful Shipibo. At best, it’s a bit awkward, and at worst, everyone I talked to mentioned incidents of discrimination. Cesar Maynas Bardeles, a practitioner of traditional medicine in Cantagallo, talked to me about how people of the community have to live dual lives, maintaining and protecting their heritage, language and customs, as well as conforming to modern mestizo ways of dress and city life. 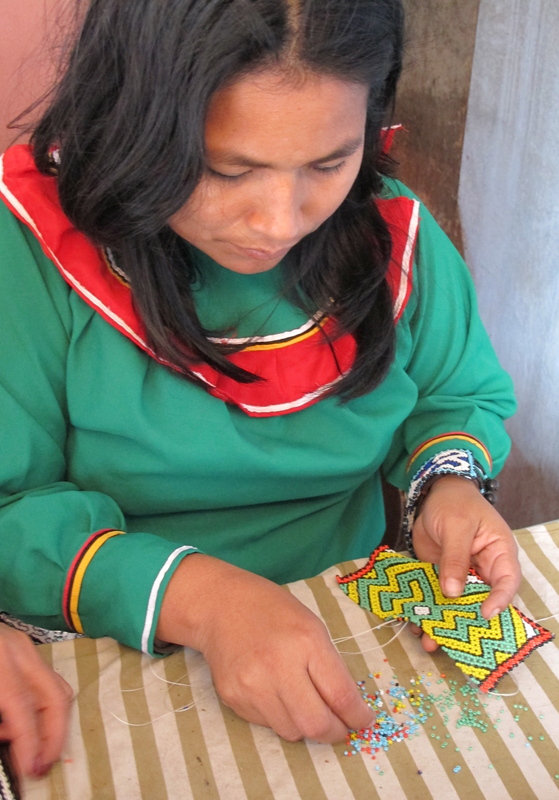 Fidelia Franco Ahuanari, Cesar’s wife and a member of Las Madres de Ashé, works on her embroidery in her house. Cesar works on two paintings commissioned by a restaurant. 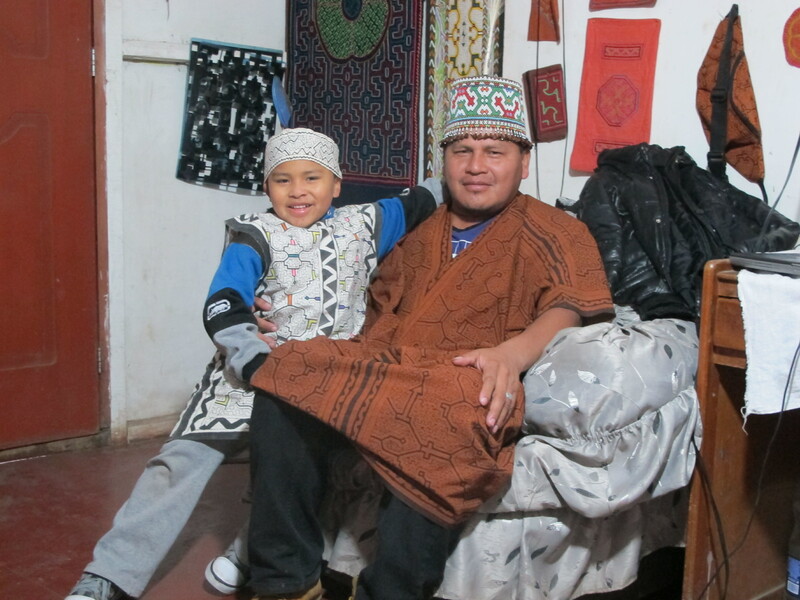 Cesar and his son Alesandro put on their traditional cushmas and coronas for a picture. 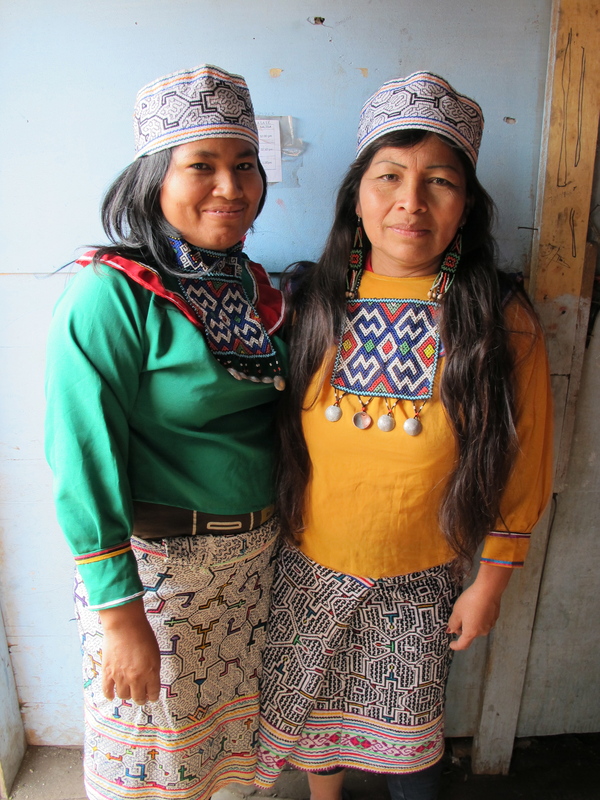 We played dress up to get pictures of the pecheras in their traditional use, and both Diana and Luz Franco Ahuanari were practically rolling on the ground laughing as they got all their traditional ornamentation in place. They managed to put on serious expressions for the camera however, but broke out in giggles every few seconds. We photographed an inventory of the jewelry they were working on. Because it’s hard to sell these relatively expensive, time consuming works on the street, they only make them on commission. 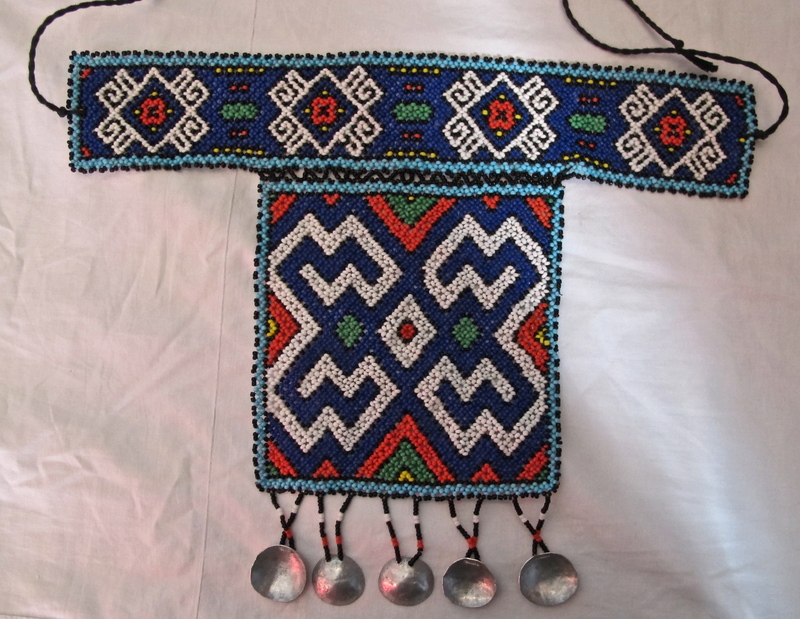 Often their commissions come from teachers who need traditional costumes for dance performances, or family members who work as shamans in Iquitos and sell pecheras to tourists. 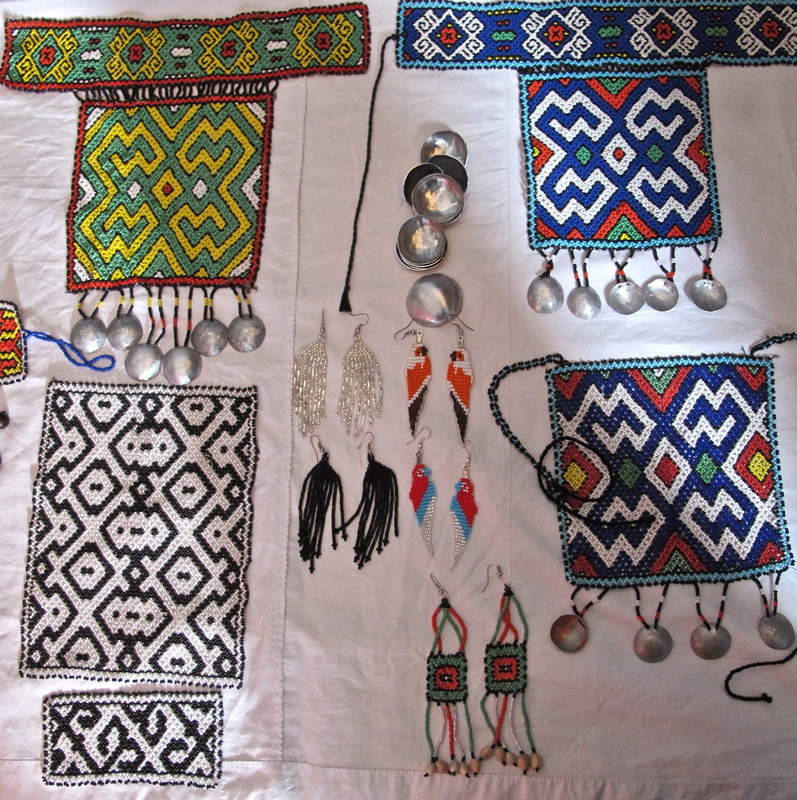 Different pechera patterns have different metaphorical meanings, such as “the union of the family”, but in general the kené patterns represent all elements of the Shipibo world: rivers, forests, animals, life, death, and the union and balance between all these elements. Different parts of the patterns have names and significance: the zig-zags around the edge represent piranha teeth, and other parts represent a turtle head, trees, and rivers. 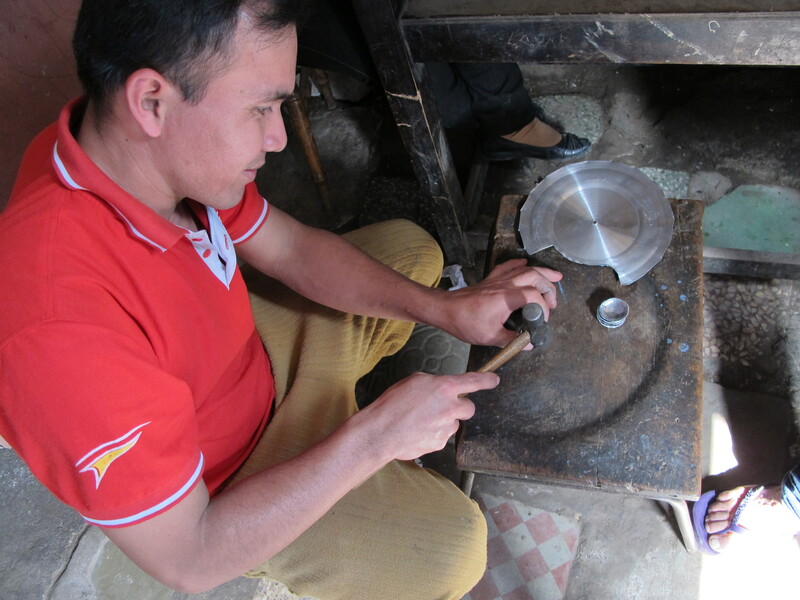 Fernando shows how the fringe decorations are cut out of an aluminum pot lid and hammered into a convex shape. 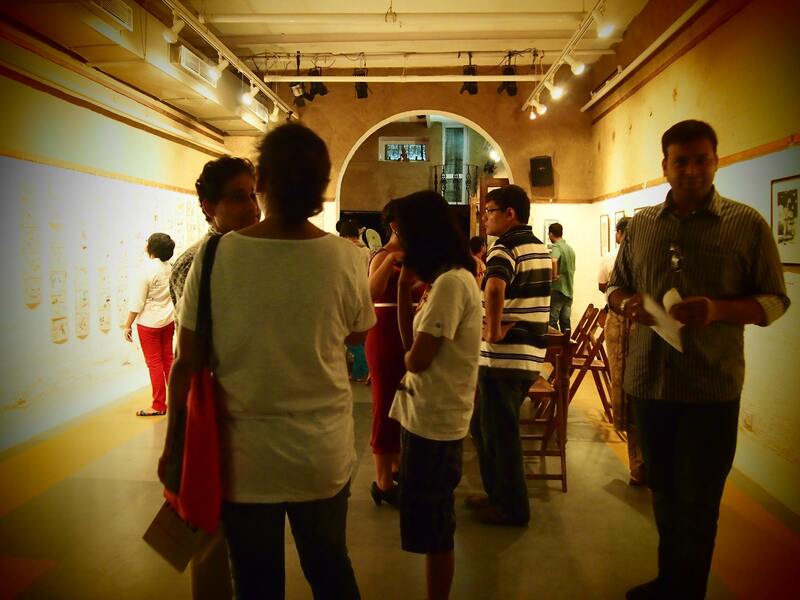 As mentioned in an earlier post, Nupur and I were invited to participate in an exhibition titled ‘HERS.’ The exhibition took place on 24 and 25 August in Delhi. 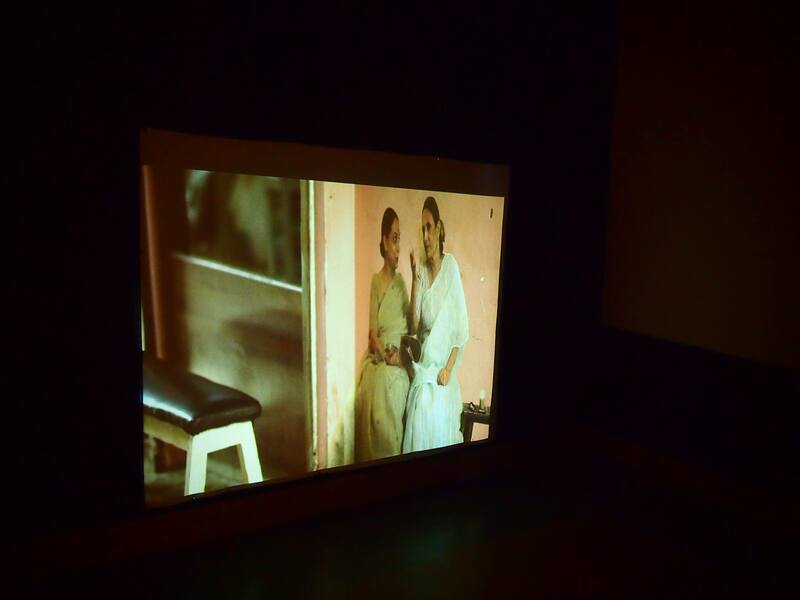 The exhibition was curated to examine the complexities of gender, masculinity and femininity in India – a perfect fit for the two projects we developed while in Delhi. 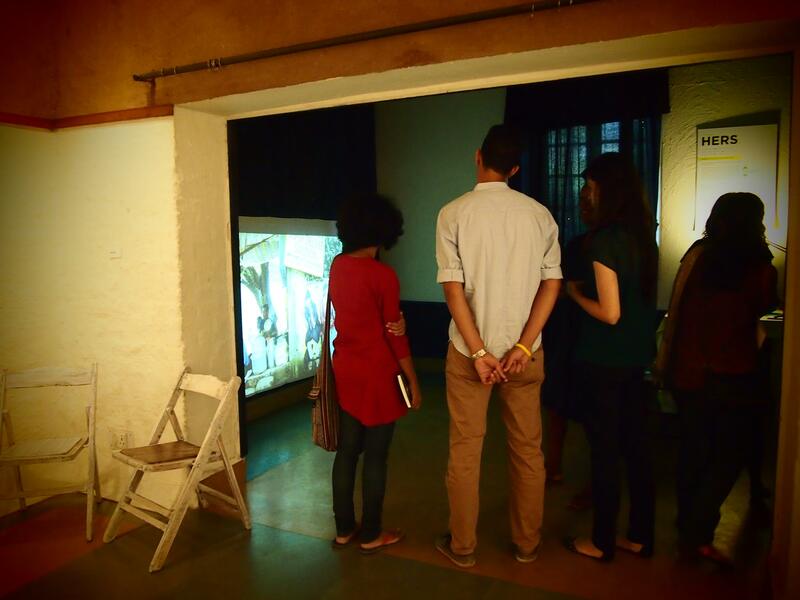 Below are moments captured during the exhibition. 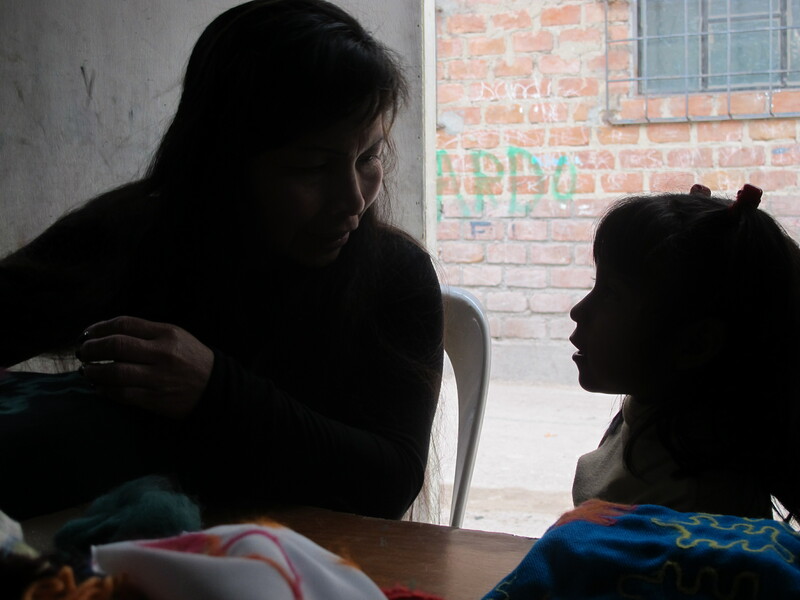 I wondered out loud to Señora Luz during my second “official” meeting with Las Madres de Ashé. Ostensibly the meeting had been their idea to get everyone together and have a further discussion (about whether or not they wanted to deal with this gringa researcher), but no one had showed up.. So I arrived in Cantagallo Monday afternoon, as fully prepared as I could possibly be with a brand new tool box full of needle-felting tools, brushes, replacement needles, sheep and alpaca wool, different kinds of fabric, and a list of the prices of everything and the business cards of each store where materials could be found. 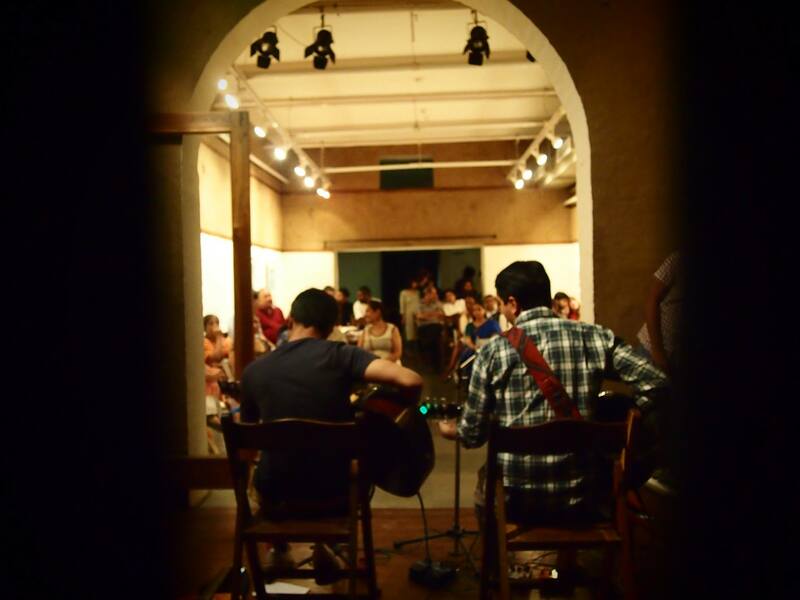 We set up in the meeting room, and sure enough, people wandered by, poked their heads in, and joined the workshop. Certainly not because we had put up posters a few days before! I never pictured myself as a teacher, not to mention leading a workshop, but that’s the best thing about artists: You don’t have to explain anything to them, just make a lot of materials available, and they are already on their way! 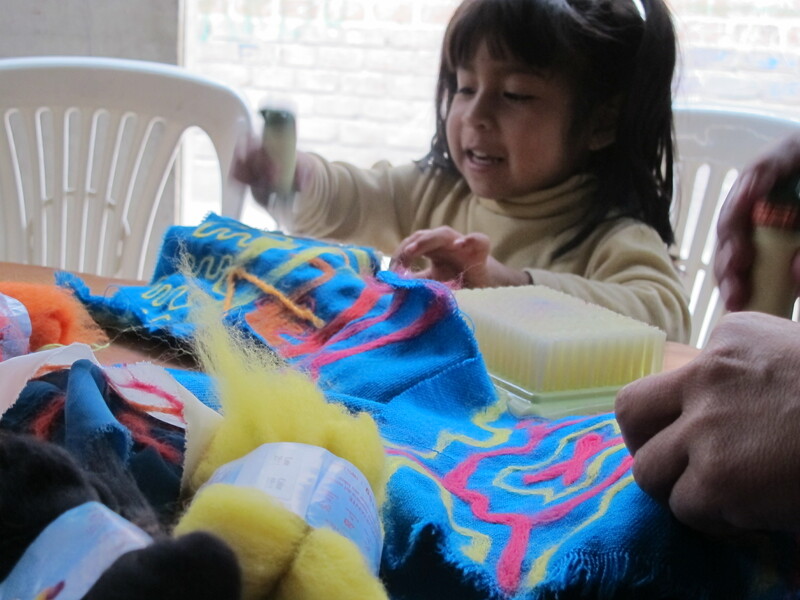 In fact, I barely needed to demonstrate how the needle-felting tool was held and already these talented artisans were manipulating the new materials with ease, tracing out their patterns, and needle felting like pros. Women wandered in and out of the workshop, on their way to or from buying fish, sometimes rushing back to their houses to grab a different material to experiment with. A little girl named Belén came in with her mother, and was asked by all to sing us songs while we worked. Very quickly she decided she wanted to needle felt too, and although the tool is filled with very sharp needles, it seemed like a safe enough toy for a five year old, right? 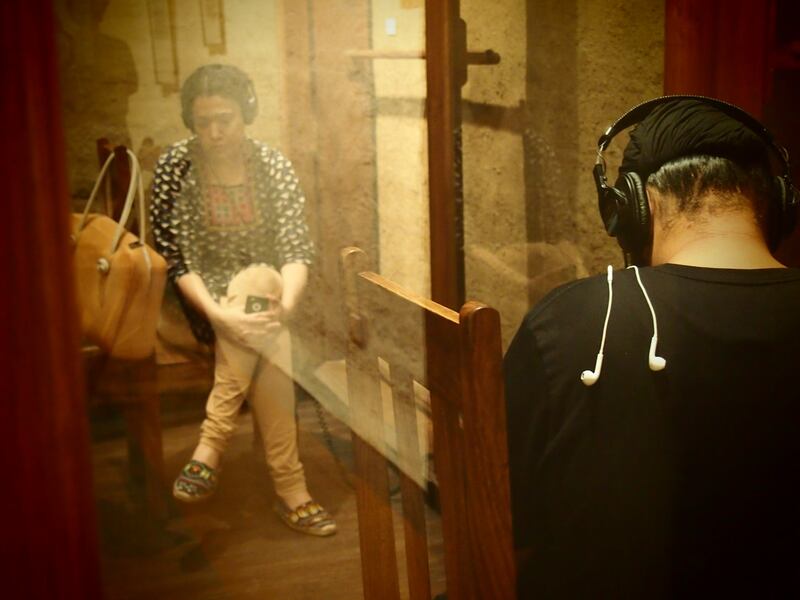 Belén sings to Señora Luz. At the end of the workshop, Belén asked me what day I would be coming back, I answered that I didn’t know, and it could be which ever day. She said “I want you to come every day!”, which made me feel like the workshop was a complete success. In fact, everyone agreed that we should meet at the same time the very next day to continue the workshop. Zoila, Belén’s mother shows off her first experiment. 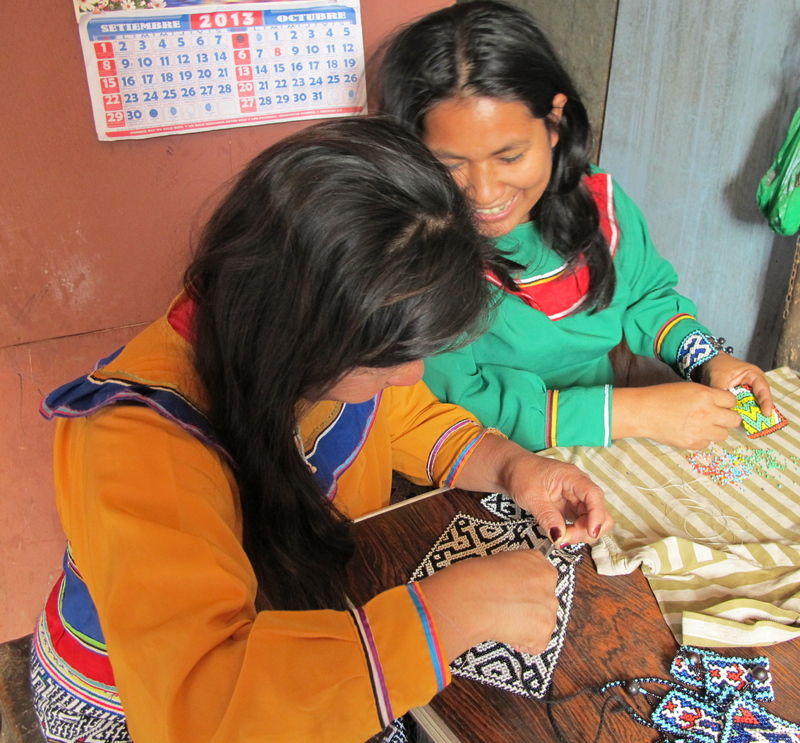 Sylvia, Nemia and Fidelia concentrate on making complex kené patterns. 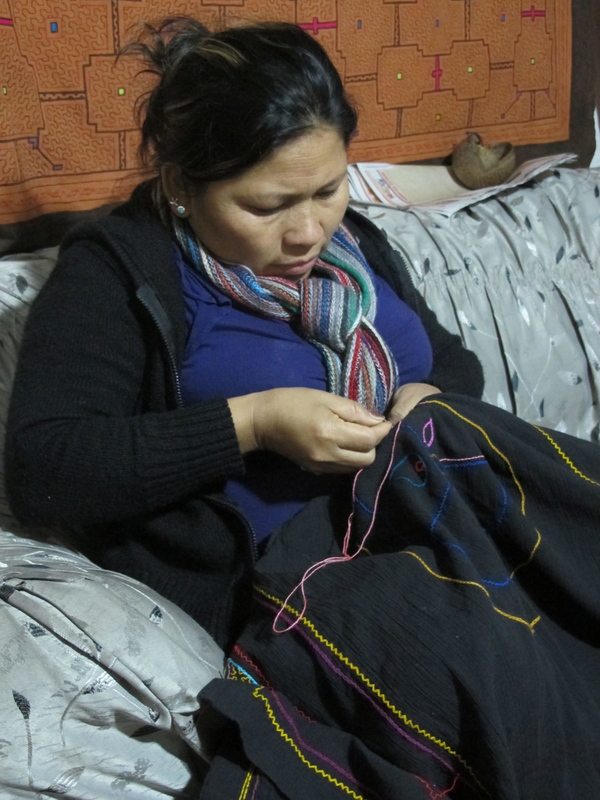 Señora Luz works on her pattern, with Nemia in the background. When heading to the workshop the next day, I thought to grab a handful of printer paper and a box of crayons just before leaving the house. So, when a whole group of roaming, curious children showed up at the workshop in the afternoon, nine year olds carrying their baby siblings, I was prepared. 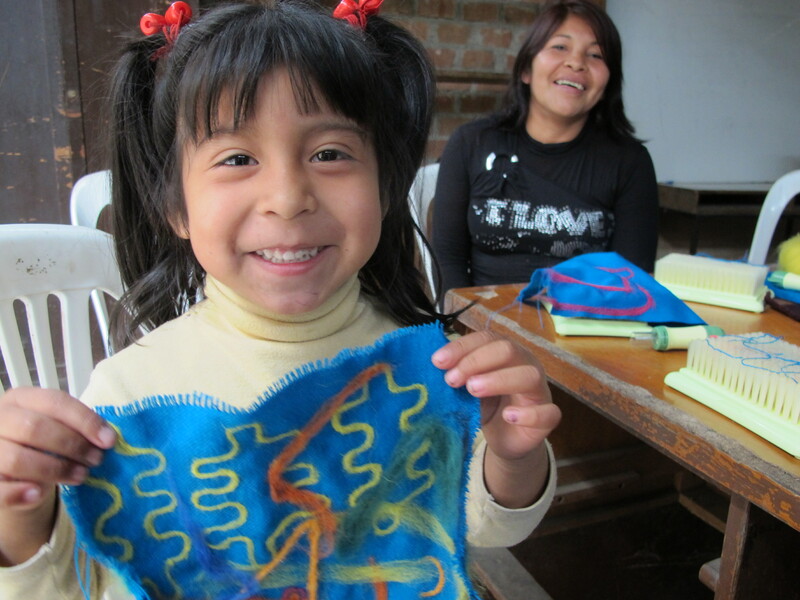 The felting workshop turned into a card making workshop as they all made drawings and letters for their mothers, sharing well, and yelling to each other “who has the green?” “give me the brown!” “hey! the baby dropped the blue on the floor!”. They would show me what they were working on periodically, pointing out who had copied their drawing of mountains and houses. Most cards featured big red hearts and rainbow lettering “te amo mamita“. Once they had used up all the paper, they picked up the crayons, picked up their siblings, and trooped off in search of the next activity.